The Harriers are in cup action tomorrow evening just days before a far more important cup tie. This Setanta Shield game at Burton Albion has come at a very inconvenient time for us with the FA Cup 1st round game against Cambridge Utd due to be played at Aggborough on Saturday. It's for that reason that the team that Mark Yates puts out at the Pirelli will be made up of all the fringe players (seven) plus regulars making the other four with five on the bench. So nine of the team (minus Luke Jones - suspended) that normally start a game will be involved unless both Yates and Neil Howarth get their boots on to join in the fun. Also involved will be two youth team players, Nathan Hayward and James Insall, who could also be on the bench but may be there as part of the blooding process and just there for the experience. Some strange quirks to this Trophy this season has seen us come in at the third round this time whereas last season we didn't appear until the fourth round at Hinckley in December. We won that game 2-1 and proceeded to play against a Rushden eleven in the fifth round where we got hammered 3-1 at home in a game that was frankly an embarrassment. Rushden went onto the Final against eventual winners Aldershot and probably made a bit of money out of it but really it was all a waste of time. Burton have less reason to worry about a more important game looming because they exited the FA Cup at Kettering and have only a League game at Northwich to look forward to this weekend. For that reason they probably won't take this game so lightly and could put out an almost full strength side. That side will include the Derby County striker Paris Simmons who was bought in on loan prior to last Saturdays game against Ebbsfleet. Also making an appearance for them could be yet another former Harrier now playing for Burton. 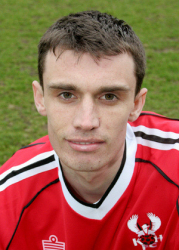 In addition to Andy Corbett, Matt Bailey and John McGrath they now also have Jon Newby (pictured above) on loan from his latest club, Greenock Morton. We have no injury worries for this game apart from Lee Baker. He left the pitch early in the second half against Grays with a slight limp but that could have been precautionary and Mark Yates could have been saving him for this more important game. I'll be happy if we win this one - it's decided on the night with penalty shoot-out if needed - but I couldn't really care if we lost 10-0 as long as we don't get any injuries or stupid sendings off. Bartlett, Coleman, Baker, Riley, Lowe, Ferrell, Creighton, Bowler, Knights, McDermott, Bennett, Brittain, Penn, Barnes-Homer, Smikle, Richards, Moore. Poole, Deeney, Webster, Simpson, James, J McGrath, Stride, Corbett, Harrad, Banim, Gilroy, Holmes, Goodfellow, Austin, Buxton, Morris, Pearson, Bailey, Newby, Simmons.